Stop #3 is Mt. Zion United Methodist Church. 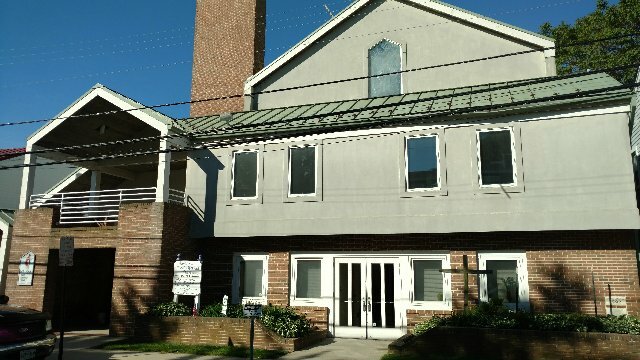 For many generations, dating back to 1980, Mt Zion Church has been the cornerstone of Eastport's African-American community. In the beginning, the congregation held meetings in an old wood shed on Chester Avenue. The first church was built here in 1896 and was substantially remodeled and enlarged in 1925. The current church was consecrated in 1992. There are families still living in Eastport, like the Johnsons, Turners, and Harrises, whose ancestors were among those who founded he church more than a century ago. Today, the church plays an integral part in the whole community of Eastport by offering needed services and spiritual guidance. All are welcome to the church's worship services and programs. Stop #4 is the Eastport Volunteer Fire Company. This modest building housed as many as 3 fire trucks and an ambulance from the founding of the fire company in 1886 until the station moved to it's present location on Bay Ridge Avenue in 1964. Eastport native Art Tuers joined the company in 1949 at the age of 16. He soon became a captain, and drove the ambulance for years. When the siren mounted on the roof blew for the third time, Tuers recalls, volunteers knew they had better be waiting on their designated street corner or they'd miss the truck as it drove by on it's way to the fire. The largest fires Tuers and the dozen or so other active volunteers battled were at the Carvel Hall Hotel in 1961, in the building which was later restored as the William Paca House, and the Trump yard in 1962.